Two decades after they were published prints of paintings by Bolivian born artist Graciela Rodo Boulanger are topping the sales charts again in - of all places - New Zealand. The curious story of how a Latin American artist who worked mainly in France has recently become one of the top selling artists at NZ's specialist art print retailer, New Zealand Fine Prints. Born in 1935 in La Paz, the cultural capital of Bolivia in South America Graciela Rodo Boulanger's parents were a concert pianist and an art collector. A talented musician Rodo Boulanger studied in Vienna in 1952 and moved to Buenos Aires at the age of 22 to further her musical career. It was in Argentina that she embraced an artistic career path instead of continuing as a professional pianist. Rodo Boulanger has always considered printmaking a key part of her practice, she was working in a French engraver's studio in the early 1960s when she met and married French diplomat Claude Boulanger and by 1968 Boulanger had her own etching studio in Paris. For most people their first exposure to the work of Graciela Rodo Boulanger was through a series of prints of her paintings such as "Holiday on Wheels" published by "Touchstone Publishers" starting in the mid 1970s. Boulanger's Print "Girl with Cello"
A large number of these prints were imported into New Zealand from the publisher in the US. Prior to 1984 NZ had import licensing which meant distributors were incentivised to purchase ludicrously large amounts of prints at one time to use up their entire precious allocation of overseas funds once they had been granted a license. Back in those days NZ Fine Prints used to have a license to import prints for "educational purposes", at one point we had about twenty years supply of famous prints by artists like Van Gogh and Monet in stock for our market of just over 4 million people! For twenty years the Boulanger prints sat in a warehouse in NZ, carefully stored in their orginal packaging until the advent of online shopping brought them to light again. Almost as soon as we listed the prints for sale online we began shipping Boulanger prints all over the world. We deliver for just $NZ15 (approximately $US10-12 depending on the exchange rate on the day) by Airmail and prints are wrapped in acid free tissue and packed in super solid cardboard mailing tubes so they will get to buyers in perfect condition. With worldwide demand both from new collectors of her work combined with people looking to buy pristine replacements of a favourite print that has faded or been damaged prints by Graciela Rodo Boulanger are outselling prints by NZ's most popular artists and printmakers in their own land! However with a rapidly dwindling supply of prints, some titles (especially from her bicycle and musical themed series such as the girl with cello print that we have used to illustrate this article) are getting very low on stock. We have sold out of several prints over recent weeks and today have less than ten on hand of several titles listed for sale in the Graciela Rodo Boulanger collection at our gallery. When the artist began publishing reproductions of her work nearly 40 years ago she would never have imagined that they would lie unsold for decades in a small country in the middle of the South Pacific only to re-appear in the top selling charts (albeit briefly) thanks to the magic of being able to search online for exactly the print you need from anywhere in the world. 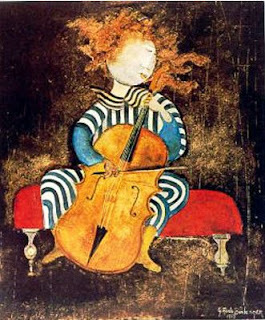 Hi, I have a G.RODO BOULANGER print, it is 500x600,its the girl with the cello, roger.keighley@hotmail.com.